Heavily damaged teeth (e.g. from cavities) are treated with a crown. 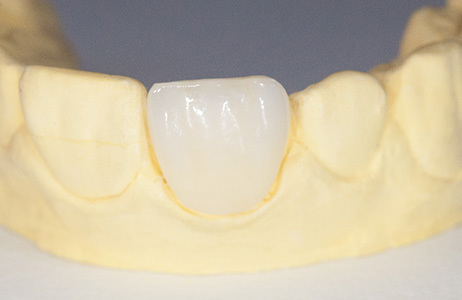 Ceramic crowns yield an impeccable result. They are individually customized to match your surrounding teeth in form and color, appearing just like your own. 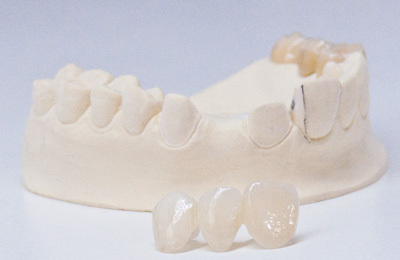 When confronted with loose or missing teeth, the resulting gaps need to be filled. Functional use is an issue, in addition to aesthetic concerns. Our aim is to achieve a healthy chewing action with good tolerance to strain. If neighboring teeth are sound and do not contain larger fillings, an implantable bridge or crown is recommended. If this is not feasible, or if there are other grounds to prevent successful implantation, a traditional crown or bridge is an alternative.